It was a scene to behold. There was Julie strumming the guitar – singing softly, there was David minding the hot dogs on the flaming grill, Cat handing out cups and paper plates, and there was Lupe Haley – dishing out her pasta dish, a fruit salad, a veggie salad and dessert. And the homeless and hungry stood patiently in line. 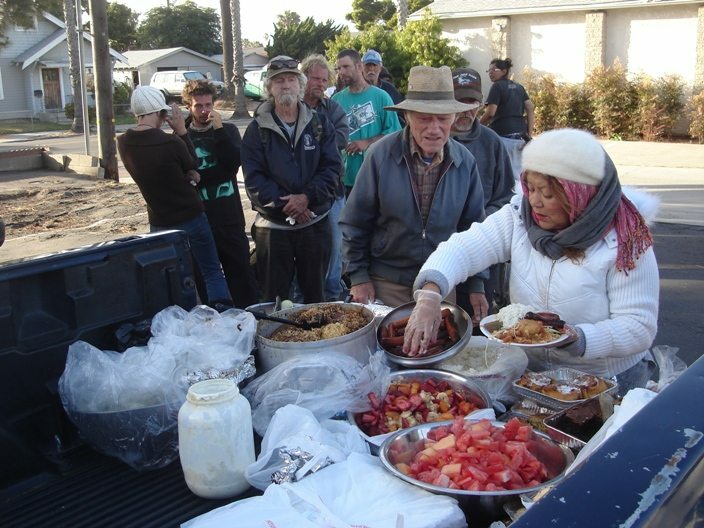 It was a Monday, and as she has every Monday for the last 22 years, Lupe Haley came down to Ocean Beach to feed the homeless and whoever else showed up. Lupe and Cat (with hat) with two local guys. 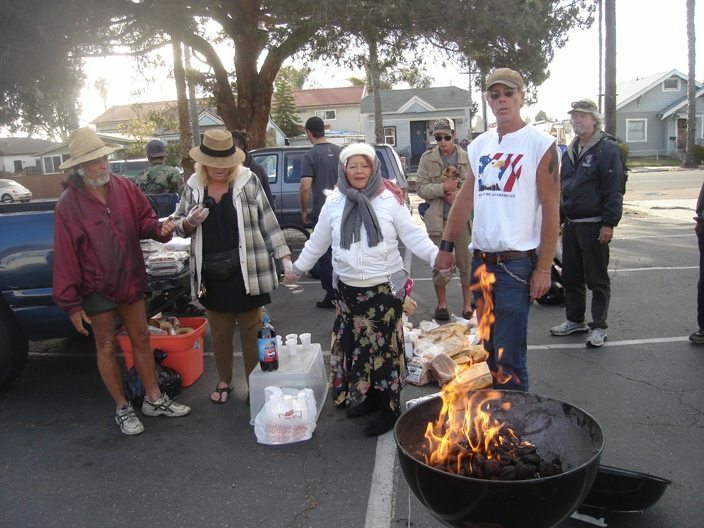 Yet hamstrung by demands by local police officers that she obtain the proper permit for public food handling, this Monday Lupe has set up her food line not at her usual site in Saratoga Park, right next to the sand, but in a friendly church parking lot off Sunset Cliffs Boulevard. Ever since Fox News Channel 5 did a spot on her April 26th, Lupe has been in the public eye – and not all of it good, for it has brought the heat down on her. Lupe, once homeless herself, has been going to the beach with her food despite her house burning, finding out she has cancer, and despite serving food in pouring rain, she has remained undeterred from coming down to the beach – until now. Obviously enjoying the attention, Lupe claims she has the proper permit, and told me that the County Health Department stated to her that she is legal and that local San Diego cops do not have the jurisdiction to keep her from feeding homeless. I did see a card she had – it was a certification that she has had food-handling education. Before the parking lot scene, I had joined about a half dozen locals down at Saratoga Park waiting for Lupe. All were regulars and had benefited from Lupe’s generosity. One older woman told me she really counts on the meal that Lupe provides. I assumed she and the others were homeless. Up drove a San Diego Police patrol car, appearing to monitor the situation. I approached the officer to see if he knew the whereabouts of the woman of the hour, but he was as puzzled as the rest of us. I remembered it was Officer Weiss who had been profiled in the Fox News broadcast on Lupe as the officer who had to order her not to feed anyone without the proper permit. A few more people wandered over to the concrete picnic table, also looking for Lupe. The older woman grew inpatient and left as the wind picked up. I imagined that my article would be titled, “Woman who feeds the homeless failed to show.” It was past 6 pm and usually Lupe appeared at the park close to 5. Finally, Julie – a young Latina who assists Lupe – called one of the other helpers and found out that Lupe was setting up her food line in the parking lot between Brighton and Cape May Avenues. By time we all had arrived, Lupe and her crew were working out of the back of a large pick-up truck. Dessert was already being handed out by Cat Peterson who has been helping Lupe every Monday for the past 8 to 10 years. Tonight’s line seemed shorter than usual, I wondered. Having to adjust the site of the food line may be a factor. 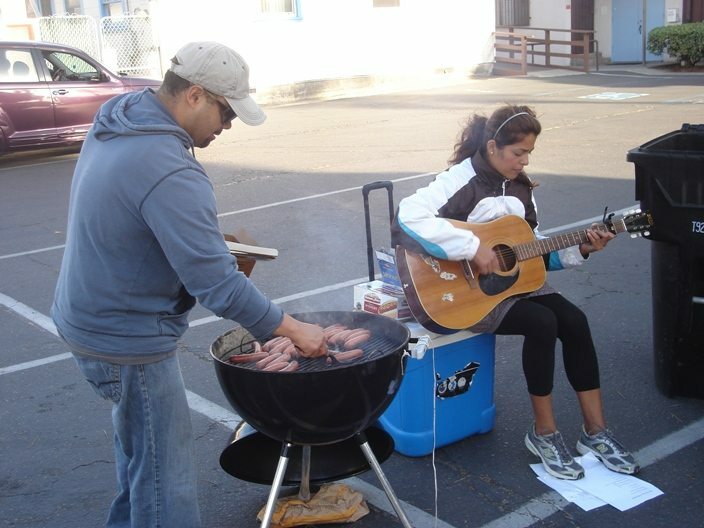 David on the grill and Julie on the guitar. She and her helpers are given food by Henrys Market, by Starbucks and other stores. I saw Henrys wrappers on a stack of packaged pastries and rolls. Folks began gathering around the truck and then settled into a line for the main meal. There was no pushing or shoving as everyone was very polite and cordial – and very appreciative. Julie’s soft singing floated over the crowd as David’s hot dogs were flipped around, appearing ready for consumption. Not everyone is appreciative at what Lupe does, however. Someone calls the police, someone is complaining, someone doesn’t want groups of homeless people gathering. “She’s my sister,” he replied without hesitation, his spiritual sister. These were humans and they were hungry and he was there to offer space for the meal. The church parking lot had become a sanctuary for the woman who feeds the homeless every Monday. And true to her beliefs, Lupe had done it again on this Monday. Awesome article Frank about an awesome woman. Thanks all around! thank you for putting a human face on this. it makes it harder for our local bigots to dehumanize the homeless. Wonderful news. The church deserves a lot of credit for stepping in and allowing Lupe to use their parking lot. Her work is the purest form of charity. It is a shame that she needs sanctuary from the police. I was there when Officer R. Weiss drove up. His manner calm, friendly, and his offer to helping Lupi acquire the correct permits, if this need be the case, appeared genuine. Kudos to Lupi for carrying on her life’s work, all minor adjustments to location aside! This woman’s strong resolve, tenacity, and compassion to simply give food to those without any stand tall above all other stakeholders in this issue. To all who were there and ate from her generous bounty, give thanks that people like Lupi still follow their dreams and help those in need ~ against all odds. I’ve been following this story from my current home in Corning, NY. Being a past resident of O.B. and at one point while I lived there, homeless myself, this story is one that’s very close to my heart. What a lot of folks don’t realize, is that jobs in O.B. (at least when I was there in 78-79) were virtually none existent. And those who were fortunate enough to have a job in town, kept it. The only way to find work, was to look out of town as I had to do. But without a car, O.B. being isolated like it is, and hitchhiking out of the question if you wanted to get to work on time 5 days a week, there were very few options. Myself for example…I worked in Sorrento Valley and had a ride in the morning although I had to hitch home. And even though there were nights that I didn’t get home till 9 or 10:00, that was fine. But when my ride lost his job, so did I because I lost my ride. No job, no income, unable to pay rent. Thus…homeless. It was the LAST thing I wanted, but there I was. I was fortunate enough to have already made some great friends, so I had an array of couches and backyards to lay my head at night. And if it wasn’t for the plasma center that so many “concerned citizens” were so against in the beginning, I probably would have suffered from malnutrition. I was able to eat and stay alive. My point is that although the homeless situation is an issue in O.B., it is for the most part, one that nobody likes or wants…including the homeless! The work that Lupe is doing is above and beyond her call of duty, but she does it dutifully out of love. Maybe we could all learn a little from her selflessness. The next time you pass one of the unfortunate on the street, why not give him something to eat, or a ride if he or she needs it, or even some work! You would be absolutely astonished at how good it would make you feel…maybe even good enough to do it again! The gang at the OB Rag, with their focus on Lupe’s plight, has enabled her through community awareness, to continue with her labor of love, for which I’m sure many, past, present and future, will hold in their memory and in their hearts, as i do. God bless you Lupe Haley, and O.B….although it seems to me that in a small way, you already have been. It is no surprise that the cops did not mess with Lupe in a Church parking lot. They are much more comfortable on sidewalks and parks. I’m assuming that she had permission from the church. And if she did, there’s nothing they could have done anyway. I also think the music was an excellent idea. Being a musician (guitar), I know how relaxing it can be, and I’m sure it was very much appreciated. Just a curious question…does anyone remember the Bonnie & Clyde duo? I know they played alot in the area back in 78…Also the Pennent in MB or PB…they had 25 cent spaghetti dinners on Tues nites, and if my memory is correct, they also served the “Upside down Margarita”. Ok, one more question…does anybody have a picture of Hodads when it was at the beach? I’ve searched the internet, but have found nothing. Bonnie and Clyde! Oh yeah, and Jumbalya. The Ram Band. and the Balzi Band. They all used to play ‘fundraisers’ for the ‘Free School’ and Jenny & Byron would let us plug in at Hodad’s…………yeah, I have pics somewhere….glad you found one. Mike, owner of Hodad’s, was a hard workin’ young tyke then! ‘People’s’ on voltaire used to do the cheap-o meals too………..ahh, good times. Officer Ron Weiss deserves credit. So does the church; what’s it’s name? Good all around. Just wondering whether this is over. Officers have very difficult choices to make every minute of their shift. By his appearance at the parking lot of the church, it would seem that Officer Ron Weiss has had a change of heart about his decision to interfere with Lupe Hadley’s aid to the homeless. I hope that he and his fellow officers continue to come out to watch over and PROTECT Lupe and her team as they feed the homeless each week. There was so much good that has come out of this media story. Help for the homeless needed a new face from the other side–Lupe is an amazing messenger. No matter which side we stand on the homeless issue, we cannot punch holes in Lupe’s credibility as a christian woman. She has had such a full life, is fighting cancer and yet, never misses an opportunity to be a public servant of God. I applaud you Lupe!!! Travelers, homeless, tumbleweeds…whatever you want to call those who do not rent in OB but live here among us, deserve our charity. Church leadership in Ocean Beach and Point Loma support feeding and providing shelter for those who live in cars or on the street. My fear is that those who call themselves Christians will begin to act upon their own congregation to retract this human aid. I grew up going to a christian-based church and I remember a few lines….”Bring us your starved, your weary and your weak” and “Do not be the one to cast the first stone.” I disagree with some of the previous posts that question why people became homeless, or that suggest that those who do drugs, do not deserve shelter, food and comfort. I am not going to cast the first stone at those who call the police on homeless or people feeding the homeless. Instead, I ask that both sides come to the monthly city council meetings to find a PEACEFUL solution to creating a place for the homeless and travelers to rest their heads and get a hot meal. San Diego News Network had promised to post this article on their online news site this weekend, but as yet it has not appeared. What has appeared are rumors and cybertalk of SDNN being sold and of a memo telling all writer contractors not to do any work for SDNN until further notice. Great! Just when I thought I was making the “big time.” Damn! Back to the drawing board. I AM an “OBECEAN”( 4928 Brighton) stuck in Colorado for 8 years, trying to find something Better, but finding NO KITE FESTIVAL or other things like the Ocean! no place Like HOME! as I am too close to Kansas. I am PROUD to hear of these efforts to help the homeless in O.B. Also very impressed that the Spirit of O.B. and the O.B. RAG LIVES ON!!!! Hi Robin, thanks for visiting. Come back soon and often and share any stories about OB that you cherish.